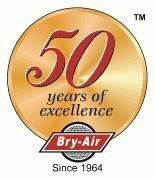 Bry-Air, Inc. environmental control systems allow for consistent control to efficiently prevent the effects of humidity. One of the most important parameters to be considered in the storage of fertilizers is the relative humidity (RH) within the storage area itself. Most types of fertilizer are stored at ambient temperatures. The critical aspect lies in the relative humidity of the air. As a rule of thumb, most fertilizers must be stored at 40% RH or lower. If the humidity is allowed to go above 40% RH, the prills, being very hygroscopic, will absorb moisture, causing them to stick together. This in turn renders the product useless. A second concern is hydrocarbons, which, if present in a high humidity environment, can cause an explosive condition should the hydrocarbons come into contact with ammonium nitrate. Successful bulk storage of ammonium nitrate, therefore, depends on humidity control and stable temperatures. The corrosive nature of fertilizer prohibits the use of certain metals, such as zinc and copper. All steel metal surfaces must be painted with special protective epoxy paints and all conduit, ductwork etc., must be aluminum. All motors and switches must be totally enclosed or in a dust-tight enclosure. All outside air is used to place the building under pressure (usually 1.25 air changes per hour). None of the air is re-circulated. All starters must be enclosed in dust-tight boxes. It is also very important that the storage area be tight and vapor proof. This includes the roof, ceiling, walls, doors and floor. Generally, the walls and/or roof are constructed with aluminum or stainless steel. Any concrete walls should be vapor proofed with epoxy (moisture barrier) paint. The vapor proof seal for the floor should be a 10 mil. thick polyethylene continuous sheet, laid on two or three inches of sand, upon which the floor is poured. All wall joints must be caulked and sealed. It is also important to be sure that all rooms are gasketed and no exhaust fans are in use. The prilling tower – low humidity improves the prills. Bulk storage – to protect the prills from deteriorating. Bagging operation – ease of handling prills. Keeping the above points in mind, there are two methods to use in solving the humidity problem. Control the relative humidity and temperature through mechanical refrigeration. Control the relative humidity and temperature by means of a desiccant type dehumidifier. The first option involves the removal of the moisture through condensation over the refrigerant fed coil. Subsequently, you must provide substantial re-heat to bring the air back to the ambient temperatures. As air cannot be re-circulated in fertilizer storage, this involves an extremely large installed capacity in terms of refrigeration and the energy needed to run it. The second option, however, provides an economical arrangement both in terms of first cost and operating cost. There is no need for expensive re-heat and the moisture is removed through the desiccant process. The operating economy is further enhanced by the fact that the reactivation energy source can be either electric, gas or steam. Thus, desiccant dehumidification equipment for fertilizer storage cannot be matched by any refrigeration system in terms of operating costs, reliability or simplicity. 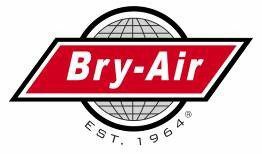 Attached is a list of customers who use Bry-Air, Inc. equipment for their fertilizer facilities.